A Cyclo-Cross World Cup is a Very Different Experience! The World Cup is a very different experience. It has a whole different feel to it than any other race except maybe the World Championships. Even though all the races in Belgium have the same guys and quality start lists there is something about a World Cup that set them apart. We left for the World Cup event bright and early, well at least early because the sun does not rise here until almost 9 am. As soon as we arrived at the course I could sense something special about the race. There were RV's scattered around the parking lot with riders like Sven Nys, Lars Boom, and the former CCB racer Bart Wellens asleep inside. Trying to focus like any other race this season, I went to pre-race ride of the course alongside the other juniors. As I checked the lines through the corners and adjusted tire pressure I saw many things that made this race special. For example, on many corners camera men were adjusting there lenses to get that perfect angle that we would watch later that evening back at the house on TV. Another special feature was the huge (Jumbo-tron) TV located at the start for watching the race. After picking up my transponder for track my lap times and final placing I headed to the start line for call-ups. I was called up on the 4th row but immediately pushed my way forward and stuck out my elbows in preparation for the start. The start was not by whistle or gun but rather by a starter’s light which is popular over here. The starting stretch was on the Zolder car racing circuit so it was straight and long with a strong headwind. Nobody wanted to waste energy in the headwind which made for a dangerous start. I was swarmed at the first grass corner and was in around 30th place. I knew it was going to be a long day on this technical and super-fast course. I fought my way through the other riders on the straightaway where I excel and worked my way into the second main group consisting of riders from 15th-25th place until I dumped it in a steep downhill which was a rutted out frozen sand corner and ripped the brake lever off my left hand shifter. After pitting I was in around 35th place and now on mud tires pumped too hard (I'm not sure our Belgian mechanics understand psi). 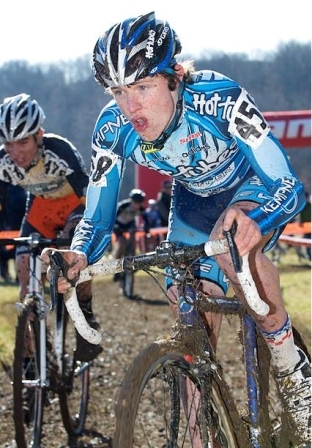 I continued to ride hard but I knew that this was my first race in Belgium and it was not going my way. I ended the day a disappointing 36th, but I was still at a WORLD CUP! I looked around a bit and watched some of the U23 race before heading home. The experience in Zolder has helped me in the other races over here where I have had much better results including 2 top 15's in a Super Prestige and a GVA (see results below). Hopefully I can continue to improve on these results and ride a great race at the World Championships in Hoggerheide, NL. Thanks for all your support and cheers. I hope you enjoyed my view of the World Cup!